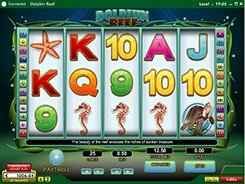 Dolphin Reef is a sea-themed slot with 5 reels, 25 paylines and a respin feature. The symbols are a seahorse, a starfish, a turtle, a clown fish, a chest, a dolphin and a set of classic playing cards from 9 through Ace. By selecting the number of active paylines and a line bet, you may adjust a total bet in a range between $0.05 and $250 per spin. 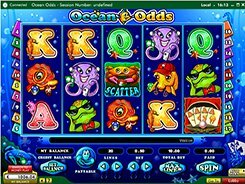 The three biggest prizes in the slot are $50 000, $10 000 and $5000. The slot features a scatter symbol depicted by the Chest. The scatter does not trigger any bonus games whatever, yet it does form winning combos when appearing in any position on the reels; three to five Chests will bring you 3 to 100 coins. 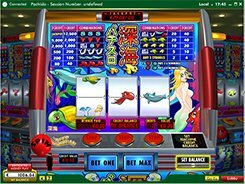 There is also a wild symbol (Dolphin) that appears on reels 2 and 4 only and substitutes for all symbols including the scatter. The wild occurring on reels 2 and 4 at a time awards a respin feature, but before the respins start, the wilds expand up and down to cover all positions on those reels. During the feature, the wild reels remain frozen while the other three reels are respun five times. PLAY FOR REAL MONEY!